but each day I inch ever closer! I suppose I've spent most of my life believing that in order to BE an artist you had to have a REALLY special gift or else you were just some crazy girl that spent a lot of free time doodling and coloring things. I spent an incredible amount of my "grown-up" time asking the Universe what the heck it wanted me to be when I grew up, because although I've had a few successful careers, not one of them ever felt like a good fit. 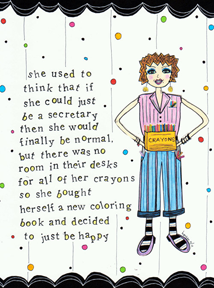 The only times I was ever truly content was when I was sitting quietly with a big blank journal and piles of markers. Something always happened in those moments that allowed me to feel more connected to myself, I felt completely happy just allowing the words and images to spill onto the pages. But then there was THAT voice... 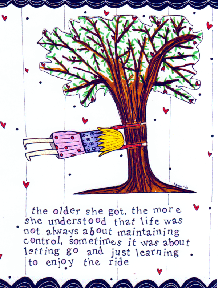 I call her NOna, and she is the scratchy little voice that pushes me to compare what I do with every other "artsy" girl. She is the one responsible for telling me that I was not good enough, not creative enough, that I just didn't have that magic touch. For a really long time I let her be the deciding voice in my world, if she said NO, I listened, if she said "forget about it," I did. For a long time I allowed her to control just about everything and got very comfortable with the idea that I just didn't cut it...and then one day out of the blue, everything changed. It was Wednesday December 22, and just another ordinary morning in our home. I woke up and was quietly sitting in the living room doodling and drinking my coffee, asking, for the millionth time, what the heck I should do with my life, when out of nowhere a new voice popped up and she was telling me that "it was time..." For a few minutes I thought I was losing my mind because the voice was as clear as a bell, and it sounded alot like me! I immediately knew what "she" meant and almost without thinking I started writing down little sentences about myself and doodling some sketches to go with them....that was the day that changed everything. I can't tell you for sure what it was but something magical happened that morning that prompted me to temporarily stop all the self-sabotaging banter and give myself permission to just BE. 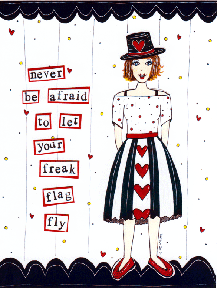 For a week or so I sketched, wrote and ultimately created a little line of greeting cards called Wednesday Wisdom; quirky little ladies that take all the insanity and observations running around my head and allow me to put them out into the world. Card after card just kept coming and for the first time I wasn't afraid of being judged and it felt amazing....until the day my husband coaxed me into opening an Etsy shop. Until then it was just me and the little ladies and I was perfectly fine with that. But for years hubby had seen the piles of writing, sketchy pictures and knew that I wouldn't be happy until I finally mustered the courage to put it out there. Come what may, he convinced me that it was time to do SOMETHING with all these little creations. So, I loaded a few of the cards and prints onto the site and within a day or two, I had my first order, and then my second and they just kept coming! That was the day I thought maybe, just maybe I might be an artist, not a VanGogh or Renoir, but a Heather Hanson, and that suits me just fine! 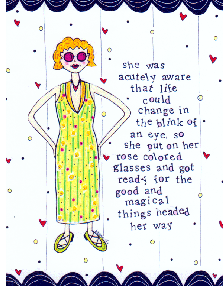 pick up one of my cards without knowing I'm the one who created it, and they actually laugh out loud. It's like a tiny little miracle every time I hear it and a sound I never get tired of. 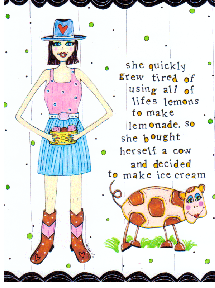 I'm in the process of creating a new line of cards and products that I hope beyond hope will give every woman the ability to silence her own scratchy NOna voice long enough to find her own version of bliss. I believe that each and every one of us comes to this planet filled with the MOST amazing gifts, the trouble is that we spend far too much time listening to the NOna's of the world and are rarely ever able to hear what's in our own hearts instead of the noise around us. Today I am happy to tell you that although NOna is constantly fighting to be heard, her voice gets a bit quieter every day. With any luck, one day soon she will pack her bags and finally hit the road for good! I'm clapping! : ) Your work ROCKS! What a great story! I feel that way too... I hope I can be JUST like you when I grow up to be a little younger like you!!! ; ) I'll be 41 soon... : ) Karrlin from poemifyme.blogspot.com ~ I just started blog in Aug. THANKS for encouraging story! Delightful...both the artist and the art! Thank you so much Lisa!!! I truly appreciate it! What a wonderful story! I must go meet Heather now at her shop! Sounds like I will be making a field trip very soon. 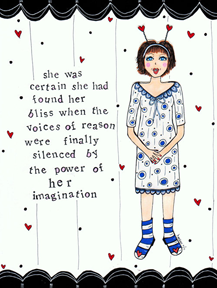 Love the "NOna" voice being silence. Perhaps that could be a line of your cards Heather. "Telling Nona "NO!"" just a thought. Thank you for sharing your story. 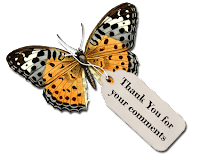 Hi there Linda.. thank you so much for the fabulous comment and for being my newest friend over at the Flawed Blog....lol.... I am so looking forward to meeting you in person; how exciting. 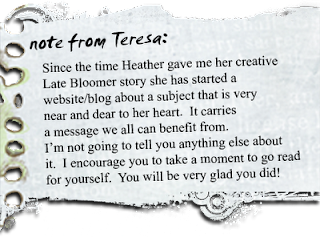 Hi Heather, welcome to late bloomers. 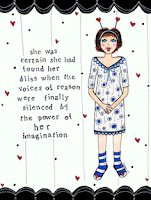 What a wonderful story and a great explanation of that little voice... NOna! I'm very happy to hear that you are quieting it long enough to create the beautiful artwork that you do. It's beautiful.